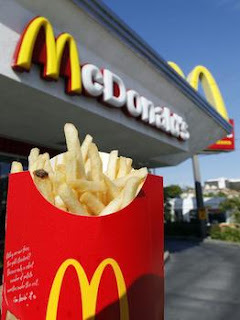 A Massachusetts man was arrested for felony assault... for throwing McDonald's french fries at his 11-year-old step-daughter. The man and his wife were engaged in an argument inside their car after picking up some food. The couple's daughter attempted to calm the fight -- but apparently failed. Instead, she got some fries tossed in her face by her unhappy father. The wife called the police who arrested the man and charged him with felony assault. Why felony assault? Because in theory french fries are hot and oily, making them a potentially dangerous weapon.